This picture is really only worth three words: "WTF!" 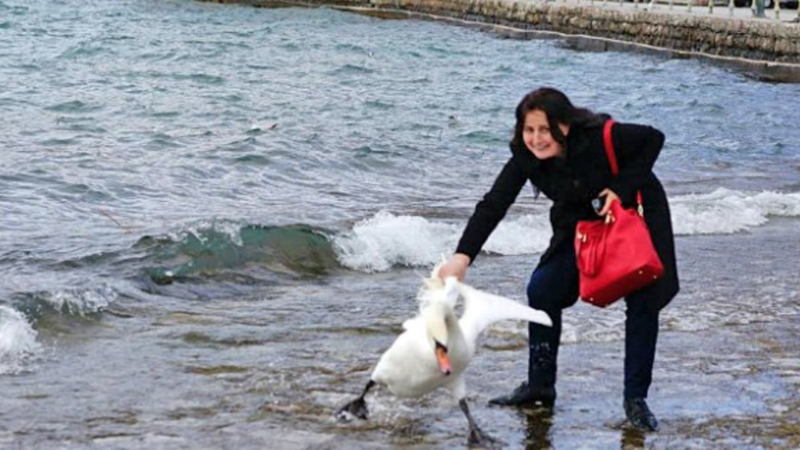 In another example of the ill-advised things people will do to take pictures of themselves, a Bulgarian tourist in Macedonia reportedly dragged a swan out of Lake Ohrid, one of Europe's deepest lakes, in order to get a selfie with it. According to multiple reports, after striking the desired pose she abandoned the swan on the shore, where it subsequently died. Macedonia Online reported that the swan remained "motionless after the encounter." However, Macedonian resident Nake Batev, who happened to be on the scene, told the Huffington Post that the swan eventually got up and swam away. While swans are known to be apprehensive of and even aggressive towards humans, those inhabiting tourist destinations and other urban areas can become desensitized and docile as a result. This is the latest in a string of selfie wildlife encounters that could be interpreted as animal cruelty. In February, a Florida man dragged a shark out of the ocean for a photo shoot. Not long before that, beachgoers in Argentina plucked a small, rare dolphin from the beach to photograph it until the dolphin overheated and reportedly died.